Remember the recent blog post on the new Powerblanket 400 series? Well, whether you read that post or not, it’s time to highlight a specific product offering from that family: the Powerblanket 400 band heater. And yes, it’s a hot item. If you’ve read much about our technology, especially as it relates to our drum and barrel heaters, then you’ve probably come across some mention of the inadequacies of band heaters. We often talk about how superior our heating blankets are to the traditional band heater. And it’s for good reason too. The traditional band heater simply can’t produce the same efficiency as your industrial heating blankets can. With that said, it may surprise you to learn that Powerblanket produces its own band heaters. In reality, when we say Powerblanket band heaters, particularly the Powerblanet 400 insulated band heater, there’s no reason to be surprised. This is because we don’t produce traditional band heaters using traditional heating technology. No, instead, we’ve created a unique and innovative approach that will outperform any other band heater on the market. The problem with a normal band heater is that they heat inconsistently. The use of a common band heater will produce hot and not-so-hot regions of heat in your drum or barrel. Because they have no thermostatic controllers band heaters just keep on heating, and this can easily scorch or burn the product you’re trying to heat. This isn’t the case with the Powerblanket 400 band heater, however. Our patented blend of technologies offers even and regulated heat distribution. Additionally, traditional band heaters are also unsafe. The hot metal band that is a band heater is exposed to everything around it, which means if anything touches it accidentally, it’s going to burn—including human flesh. Powerblanket 400 band heaters, on the other hand, are fully insulated with a durable silicone-coated, fiberglass shell that keeps the heat where it needs to be and nowhere else. This means they’re safe, even if you were to touch it on accident. Have you ever stopped to consider how much it costs to heat your warehouse? Well, we have, and the numbers are quite staggering. According to Madison Gas and Electric, “warehouses in the U.S. use an average of 7.6 kilowatt-hours (kWh) of electricity and 20,900 Btu of natural gas per square foot annually,” (Madison). Even if you’re only heating a 20X20 ft. warehouse, which would be incredibly small, that’s still an average of 3,040 kilowatt-hours and 8,360,000 Btu of natural gas annually. Over a year, that really adds up. Besides all of this, the fact is that it’s not even your warehouse that you need to heat; it’s whatever you’re storing in it. Think about it. If you could heat only the materials you are storing in your warehouse, rather than the warehouse itself, how much could you be saving on energy cost in a year? The square footage you’d need to heat would be a small fraction of your warehouse’s dimensions. Well, if you’re interested in turning the heat off to your warehouse over the winter months to save some heating cost without compromising the precious materials you store in it, just keep reading. That’s right, there is an economical solution to such a scenario, and it’s what Powerblanket is all about. Whether you’re storing paint, coatings, spray foam, wax, chemicals of various kinds, DEF, propane, or anything else that may need to be stored at room temperature or above, Powerblanket can help you cover your assets—quite literally. 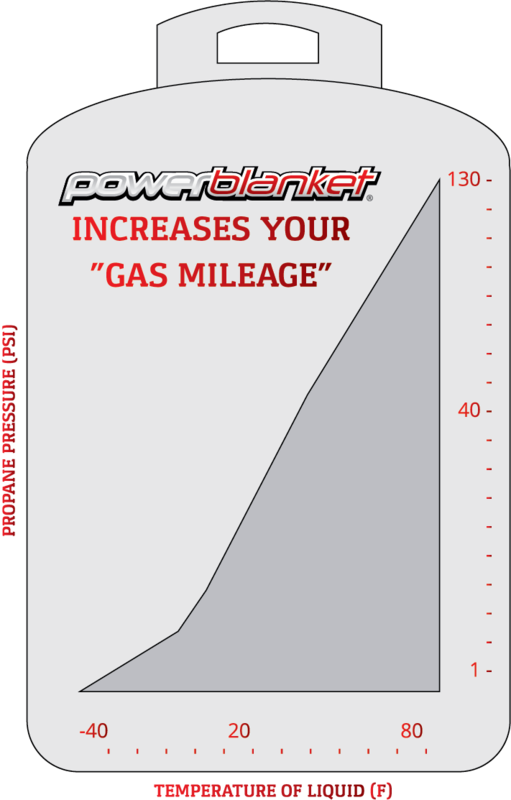 Take a moment to peruse our website and discover the many uses of Powerblanket’s patented technology. We can cover your barrels, drums, tanks, buckets, totes, and just about any other case or storage device you can imagine. In fact, Powerblanket can customize a fitted blanket to anything. If you can build it, produce it, or store it, Power blanket can cover it. If you’re storing product in a barrel or drum, there’s a lot of it. With high quantities of liquid or material, the stakes are higher if you accidentally ruin your product. If one barrel goes bad, you have a considerable amount of product to pay for. Don’t let lack of temperature control lead to major losses in your business. If you store your liquids in places that are already heated for operational reasons, temperature regulations might not be a problem for you. However, most companies that store liquids in barrels don’t keep them next to the cubicles or front desk: hence warehouse storage. Most liquids require that a certain temperature is maintained which be difficult in chilly warehouses. If this is the case with your liquid containers, finding a solution for temperature regulation is important for maintaining your products. When the winter months roll around and you have to start heating the rooms in your facilities, the warehouse isn’t going to take high priority, if it gets heated at all. In many cases warehouses are left without any temperature regulation for the cold months. If your company does have a heated warehouse, it’s likely costing you a fortune to keep a certain temperature maintained. Nonetheless, if the product you store in your warehouse needs to be at a particular temperature, you don’t have a choice…do you? There has been a bandaid for this problem for a long time called band heaters. You just strap then around your barrel and: presto! You have a completely unregulated, half heated, half frozen barrel of liquid. Let’s be frank, this hasn’t solved your problem at all; it only creates a new one. Unfortunately, band heaters don’t provide temperature control, they only heat up some of your product. So if band heaters are not the solution, what is? Unlike band heaters, Powerblanket barrel and drum heaters apply an even distribution of heat: it can be set to peak at whatever temperature is needed, thus providing temperature regulation and not just heating your product to a boiling point. Additionally, Powerblanket barrel and drum heaters also provide savings—whether we’re talking about the alternative of heating your warehouse or the cost of using band heaters. Powerblanket’s patented design allows for an economic and efficient distribution of heat within an insulated vinyl shell. This means less energy is needed to maintain the same temperature level. So take a sigh of relief at your storage conundrum and give use a call. With months of winter conditions and cold weather upon us much focus and attention in many industries turns to the need for heating solutions. And while standard products are often the first line of defense, custom heating solutions often present your best option. The point to be made is that there are a number of industries whose business can be affected by cold weather. There are several sources of heating solutions that offer the benefits associated with protecting products and equipment to include freeze protection. Perform the due diligence; do the research. Keep in mind that among those who offer these solutions there are a few reputable sources who offer both standard products as well as custom solutions to include application advice, engineering expertise, and technical support. Use discretion in making your purchasing decision, your business depends on it! At Powerblanket® our brand and innovative technology have always gone hand-in-hand. Our patented graphite-based heat spreading technology known as GreenHeat Technology™ is found in every electrically powered heating solution we manufacture today. GreenHeat Technology provides many benefits that have driven the demand for the products we build. We have always prided ourselves on listening to our customers. Making a concerted effort to truly understand the application requirements and desired results is what allows us to translate product features into deliverable expectations. Our commitment to producing innovative heating solutions is what has allowed us to diversify our product offering; both standard and custom. Our people are truly our greatest asset; our customers and their many application challenges are our greatest source of motivation and success. Epoxy consists of two components, resin and a curing agent. Many epoxies have an initial cure that results as the two components are combined and the cross-linking occurs to provide the desired material characteristics. In order to achieve the desired material characteristics, many epoxies require a heated cure cycle. During the cure cycle there are key elements that are necessary to meet the requirements of a good cure to provide the qualified properties of the epoxy for its specific intended purpose. Unfortunately, most available heating solutions for curing epoxy are expensive and ineffective. In order to meet proper cure cycle requirements many companies rely on extremely expensive ovens, high temperature and costly autoclaves. These types of facilities and tools are not only significant capital investments, but are also expensive to operate. Additionally, these types of heating solutions require a significant amount maintenance and calibration. For lower temperature epoxy cures, heat blankets provide a very reliable and efficient method of curing. Technology now exists in some heating blankets on the market, especially with Greenheat technology that provides even heat distribution, tight temperature control, and programmable temperature controls. These heating blankets are very economical to operate. This new technology is ideal for the epoxy curing process because it’s so critical to provide even, consistent heat to help the epoxy cure properly. Large operations with loads of cash to spend, may like some of the standard heating solutions. However, most businesses operate on a budget and closely watch their expenses. These businesses will probably find some of the newer technology, like heating blankets to be the ideal choice. Let’s face it, nobody likes band heaters. Nobody! When it comes to solving heating problems, band heaters are not the answer. In fact, they’re part of the problem. Band heaters are designed to provide a lot of heat in one, centralized location. This concentrated heating approach requires an extremely high watt density, which can overheat and burn whatever is stored in the drum. Some businesses store spray foam or other expensive chemicals in drums and buckets. These businesses can’t afford to have their products and materials scorched and burned. Until recently, band heaters have been the only option available to businesses that need to apply heat to their materials. The flawed approach of band heaters has left many business owners frustrated and looking for other solutions to their heating problems. So if band heaters are dangerous and ruin your materials, what alternatives are there? The answer is surprisingly simple: blanket-style drum heaters. Blanket drum heaters offer businesses a better heating solution because they spread heat evenly across the entire blanket. No product is ruined or wasted because heating blankets eliminate hot and cold spots. So if your business has been stuck using ineffective and outdated heating solutions like band heaters, it’s time to make a change. Do some research and switch to an economical and efficient heating blanket for bucket and drum heaters. Diesel exhaust fluid (DEF) is an injected additive to a selective catalytic reduction (SCR) system. SCR is a technology that uses a urea based DEF and a catalytic converter to significantly reduce oxides of nitrogen (NOx) emissions. SCR is the leading technology being used to meet 2010 emissions regulations. The Environmental Protection Agency (EPA) has created a set of standards that are designed to help alleviate many of the pollutants released into our air by the exhaust of diesel engines. The first federal standards (Tier 1) for new non-road (or off-road) diesel engines were adopted in 1994 for engines over 37 kW (50 hp), to be phased-in from 1996 to 2000. In 1996, a Statement of Principles (SOP) pertaining to non-road diesel engines was signed between Environmental Protection Agency (EPA), California ARB and engine makers. Companies this size will likely need storage tanks for their DEF that will exceed the standard 330 gallon totes. Many will seek storage tanks in the thousand plus gallon range. In any size tank there are items of relevant interest. If DEF is kept to temperatures between 15ºF and 65ºF (-9ºC and 18ºC), it will last a minimum of 1 year without problems. In cold temperature regions it is recommended to store DEF in a storage unit. In warm temperature regions it is recommended to store DEF in a shaded area. New climate control systems specifically for DEF are being developed. How do you keep a large storage tank protected from freezing conditions? There are options on the market that offer solutions. Powerblanket is one of several companies creating innovative solutions for these types of tanks. Everyone has to have a solution for staying compliant with EPA standards. A SCR/DEF system or an equivalent, equipped with an effective heating solution is a great way to stay compliant. Is it necessary to have evenly distributed heat for curing epoxy resins? The simple answer is, yes. If you are using heat to cure something, having even heat distribution will cure or heat the product evenly. If heat isn’t distributed evenly, only part of the product will cure while other parts will remain uncured. Curing epoxy in this manner is doable, however, it is not recommended. Let’s consider a common heat method for a minute, heat trace (localized heat). Heat trace is strung out along the material and only heats what it rests upon. Will it get the object hot? Sure. Will it heat the entire surface to the same temperature, regardless of the placement of the heater? No. It will have hot and cold spots. Now let’s consider an alternative heating method, GreenHeat Technology™. If you were to place a heated blanket with GreenHeat Technology over the top of an object, it will heat evenly across the entire blanket. The difference is that unlike heat trace , the blanket disburses the same amount of heat simultaneously across the surface of the blanket. This heating method drives the same amount of heat into the substance being heated. Let’s take a cookie for an example. If you placed heat trace on cookie dough and turned it on for a few minutes, you would have a partial cookie surrounded by dough on both sides. If you kept the heat trace on, in an effort to cook the entire cookie, you would eventually cook the entire cookie however, you would have blackened and burnt sections where the heat trace tape was laid. If you took the same amount of dough and placed the previously mentioned heating blanket on top of it, it would cook the cookie evenly. There would be no burned spots and doughy spots. Epoxy needs to cure in a similar manner, with evenly distributed heat.